Let’s look a bit deeper then, if Oracle provides no clue. Let’s start with the strace and sql_trace combination. For the test, I am doing a direct path full table scan on a table. Such a scan must allocate a buffer for the results (direct path reads do not go into the buffercache, table contents are scanned to the PGA and processed from there). Lines 6-9: This probe is triggered once the function kskthbwt is called. This is one of the functions which are executed when the wait interface is called. The if function on line 7 checks if the process specified with -x with the systemtap executable is the process calling this function, and if the register rdx contains the wait event number. This way all other waits are discarded. If the wait event is equal to wait_event_nr, which is set to the wait event number 524, which is ‘PGA memory operation’, the printf() function prints kskthbwt and the wait event number. This is simply to indicate the wait has started. Lines 10-13: This probe does exactly the same as the previous probe, except the function is kskthewt, which is one of the functions called when the ending of a wait event is triggered. Line 14-17: This is a probe that is triggered when the mmap2() system call is called. Linux actually uses the second version of the mmap call. Any call to mmap() is silently executed as mmap2(). Inside the probe, the correct process is selected, and the next line simply prints “mmap” and the arguments of mmap, which I picked from the CPU registers. I do not print a newline. Line 18-21: This is a return probe of the mmap2() system call. The function of this probe is to pick up the return code of the system call. For mmap2(), the return code is the address of the memory area mapped by the kernel for the mmap2() call. Line 22-25: This is a probe on munmap() system call, which frees mmap’ed memory to the operating system. Please mind there are no accolades following the if statements, which means the code executed when the if is true is one line following the if. Systemtap and C are not indention sensitive (like python), I indented for the sake of clarity. This makes it quite clear! The event ‘PGA memory operation’ is called when mmap() and munmap() are called. Which are calls to allocate and free memory for a process. The file descriptor (fd) value is set to -1, which means no file is mapped, but anonymous memory. Another interesting thing is shown: first mmap is called with no address given, which makes the kernel pick a memory location. This memory location is then used for a second mmap call at the same memory address. The obvious question for this is: why mmap two times? The first mmap call asks the kernel for a chunk of memory. PROT_READ and PROT_WRITE mean the memory should allow reading and writing. MAP_PRIVATE means it’s not public/shared, which is logical for Oracle PGA memory. MAP_ANONYMOUS means the memory allocation is not backed by a file, so just an allocation of contiguous memory. MAP_NORESERVE means no swap space is reserved for the allocation. This means this first mapping is essentially just a reservation of the memory range, no physical memory pages are allocated. The next mmap call maps inside the memory allocated with the first mmap call. This seems strange at first. If you look closely at the flags, you see that MAP_NORESERVE is swapped for MAP_FIXED. The reason for this strategy to make it easier for the Oracle database to allocate the memory allocations inside a contiguous chunk of (virtual) memory. The first mmap call allocates a contiguous (virtual) memory area, which is really only a reservation of a memory range. No memory is truly allocated, hence MAP_NORESERVE. However, it does guarantee the memory region to be available. The next mmap allocates a portion of the allocated range. There is no MAP_NORESERVE which means this allocation is catered for for swapping in the case of memory shortage. This mapping does use a specific address, so Oracle can use pointers to refer to the contents, because it is certain of the memory address. Also, the MAP_FIXED flag has a side effect, which is used here: any memory mapping done to the address range is silently unmapped from the first (“throw away”) mapping. This looks like the size of memory allocated with the first mmap call for the PGA memory reservation is put in p1, and the size of the allocation of the second “real” memory allocation is put in p2 of the ‘PGA memory operation’ event. One thing that does look weird, is the memory is not unmapped/deallocated (this is a full execution of a SQL, allocated buffers must be deallocated? Ah! It looks like some memory housekeeping is not done during the previous execution, but is left for the next execution, the execution starts with munmap(), followed by a mmap() call. 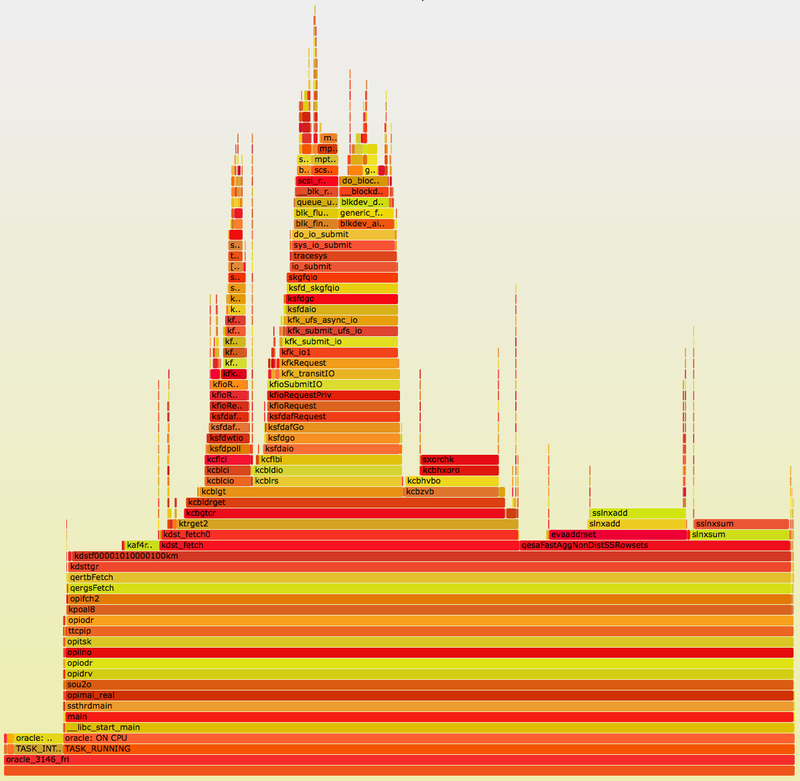 The first munmap() call deallocates 2 megabyte memory chunk. The next mmap() call is different from the other mmap() calls we have seen so far; we have seen a “throw away”/reservation mmap() call with the memory address set to 0 to let the operating system pick an address for the requested memory chunk, and a mmap() call to truly allocate the reserved memory for usage, which had a memory address set. The mmap() call following munmap() has a memory address set. However, protection is set to 0; this means PROT_NONE, which means the mapped memory can not be read and written. Also the flags number is different, flags 16434 translates to MAP_PRIVATE|MAP_FIXED|MAP_ANONYMOUS|MAP_NORESERVE. As part of releasing PGA memory, it seems some memory is reserved. The wait event parameters are all zero. When p1, p2 and p3 are all zero, it seems to indicate munmap() is called. As we just have seen, memory could be reserved. Also, when p1/2/3 are all zero there is no way to tell how much memory is freed, nor which memory allocation. The next wait is the timing of a single mmap() call. Actually, the mmap() call allocates the previous mmaped memory, but now with protection set to 3 (PROT_READ|PROT_WRITE), which means the memory is actually usable. The p1 value is the amount of memory mmaped. The last wait is a familiar one, it is the mmap() call with memory address set to zero, as reservation, and another mmap() call to allocate memory inside the previous “reserved” memory. However, the p1/2/4 values are now NOT set in the same way as we saw earlier: only p1 is non zero, indicating the size of the first mmap() call. Previously, p1 and p2 were set to the sizes of both mmap() calls. With Oracle version 12.2 there is a new wait event ‘PGA memory operation’. This event indicates memory is allocated or de-allocated. Until now I only saw the system calls mmap() and munmap() inside the ‘PGA memory operation’. What is visible, is that the functions between the plsql interpreter (pfrrun) and the function that makes the operand evaluation switch to PL/SQL (evapls) now is only one function, peidxrex. However, inside the evapls function there are two additional functions called (kkxmsagof, kkxmsagif, not readable) which take noticeable time. Conclusion at this point is pragma udf is doing it in yet another way than a native PL/SQL function and the subquery factoring. So, that’s very close to using this function using subquery factoring, a bit longer (2192685). This is very strictly depending on what is actually done, so milage may vary for your own use. A simple calculation shows that doing the addition native in SQL only takes 43389/2211412*100=2% of the runtime of PL/SQL with pragma udf. This statement executes a full table scan, I’ve closely guarded the IO times were alike. But it looks there is a whopping difference between including PL/SQL and not: 113/19*100=595%, or differently worded: almost six times slower. How does this work? Let’s have a look using stapflames. 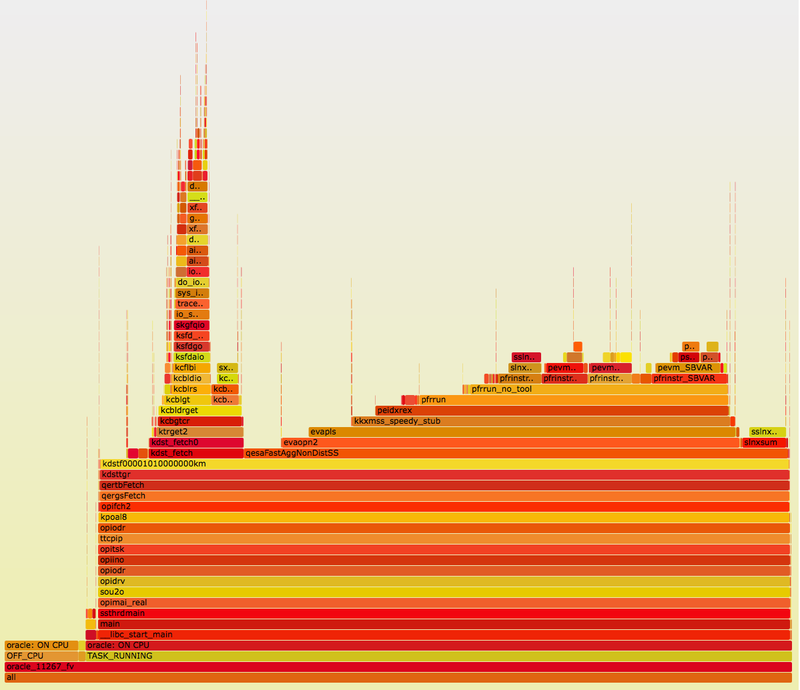 The idea behind flame graphs in general is to understand in which (c code) functions (user mode and kernel mode) the time is spend. Because of the full backtrace (all the called functions on top of each other), it gives an insight on how a program is working. Yes, that is right, the only thing this anonymous PL/SQL block does, is declare a number to a variable named ‘t’, and then loop adding one to the variable until the variable reaches the number 1000000. Again, what this program does is not interesting nor functional, the only thing it needs to do is run, so when we profile the program we are sure it is doing PL/SQL. 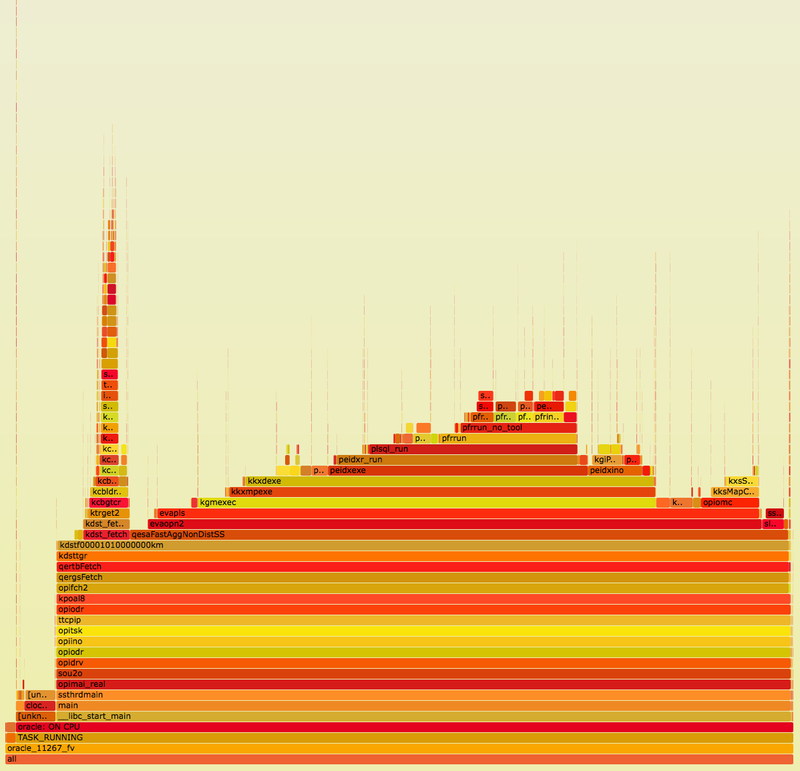 I have taken the flamegraph of all time considered on cpu by the Oracle database. 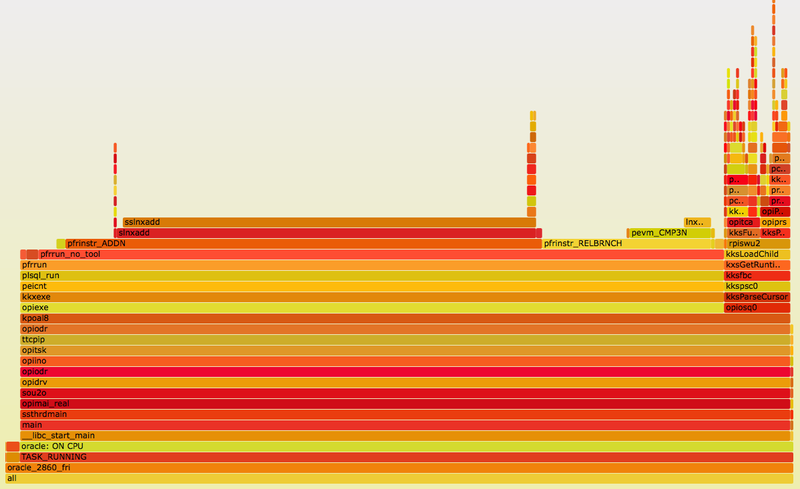 First of all, one important property of flamegraphs is shown: the sequence is random. If you look at the kpoal8 function, you see there are two different paths taken from this function: opiexe (oracle program interface execute) and opiosq0 (oracle program interface prepare to parse). Of course the PL/SQL block is first parsed and then executed, so the order is different than shown. What is also very visible, is that almost all time executing, is done using a function ‘pfrrun’, which seems to be the main function executing PL/SQL. On top of that we can see some functions which roughly resemble the functionality used in the PL/SQL block: pfrinstr_ADDN (addition, t:=t+1) and pfrinstr_RELBRNCH (the loop). This also gives a fair indication PL/SQL is interpreted rather than compiled. Anyway, what is important is that from looking at the little test above, we can distinguish running PL/SQL from SQL by the pfrrun function. 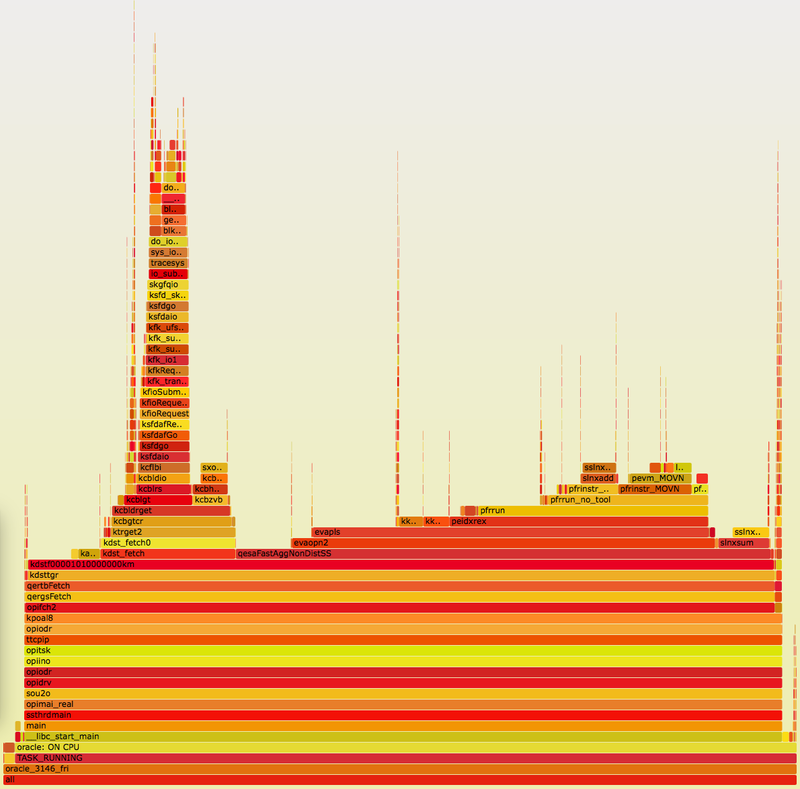 The flamegraph shows all the time considered running on CPU for executing the statement ‘select sum(add_one(id)) from t2’. There is a lot to see! When we look on top of the function kpoal8, we see the function opifch2. This means the vast majority of the time is spend in the fetch phase of the SQL statement. On top of the opifch2 function we see two functions which start with qer. ‘qer’ probably means Query Execute Rowsource. ‘qertbFetch’ is the fetch procedure for table scans. Then we see the kdsttgr function (kernel data scan table get row), and then the ultra fast table scan function (kdstf; kernel data scan table full) followed by a lot of zero’s and/or one’s and ending with ‘km’ or ‘kmP’. There are a lot of kdstf functions in the Oracle executable, I assume the zero’s and one’s after ‘kdstf’ are a bitmap of potentially needed functions during the full scan, so the full table scan function can omit a lot of choices on runtime, leading to better CPU efficiency. See an article by Tanel on what this means. In the full table scan function, there are two main functions which consume time, kdst_fetch and qesaFastAggNonDistSS. ‘kdst_fetch’ and deeper functions are functions related to doing IO for reading the data from the data file. ‘qesaFastAggNonDistSS’ is the main function for actually processing the data. The function qesaFastAggNonDistSS has two main functions consuming its time, evaopn2 and a function visible as ‘sl..’, which is actually a function called slnxsum, in other words, the sum() function. The function evaopn2 is a function to evaluate operands. This evaluation is the path towards executing the PL/SQL function. Actually, when carefully looking at the evaopn2 function, we see the slnxsum function, and ‘evapls’, which is the function to switch to PL/SQL. The two main functions in ‘evapls’ are kgmexec and opiomc. Again here the order is switched; what happens here is first a cursor must be mapped for executing PL/SQL (opiomc function), after which it can be executed (kgmexec function). It becomes apparent that with subquery factoring, there are way lesser functions between the evapls and pfrrun functions. Also mind there is no codepath for mapping a cursor. The time spend in PL/SQL, by looking at total time spend in the evapls function reduced by 32% ((1-2192685/3203637)*100). The most simple conclusion I can make is: do not use PL/SQL if you can solve it in SQL, like in the example above. This does not mean you should never use PL/SQL, contrary: in a lot of cases processing should be done where the data is, and sometimes you need a procedural language for that. I made a lot of assumptions in this little investigation. The function naming (the translation from the Oracle C function name to what functionality it is supposed to deliver) are speculations. The context switch between SQL mode and PL/SQL mode looks like it is technically setting up the execution environment for PL/SQL. Indeed this takes time, and the true PL/SQL execution time when repeatedly executing PL/SQL is very low in my case. Please mind actual times will differ on different systems. However, the main conclusion is that using PL/SQL in SQL execution probably is not the most performant thing to do, including using subquery factoring. Luckily, with Redhat Enterprise Linux and Oracle Linux version 7, there is the kernel version 3.10 as the stock RedHat kernel version. This kernel version supports systemtap userspace return probes. A systemtap probe is a way to trigger an action when a certain action (the probed event) is started, a return probe is an action triggered when an action is finished. The Oracle UEK kernel version 3 at the time of writing is version 3.8, which does not support this. My current knowledge is consistent reads are handled by the Oracle database C function kcbgtcr(). Current reads are quite probably handled by the function kcbgcur(). Having said that, I know of at least one exception to this: scans on hybrid columnar compressed segments do not use the kcbgtcr() function. Please mind all kernel code translations, like kcbgtcr (kernel cache buffers get consistent read) are pure guesses, albeit somewhat educated guesses, as there are a lot of internet publications naming these, including My Oracle Support itself. With the 3.10 version kernel, we can create a small systemtap script to measure the time between the start and stop of the kcbgtcr routine. If you want to experiment with this, it is probably best to download the latest version of systemtap and compile it yourself.. This is the reason you see /usr/local/bin/stap in the shebang. This shows the function being executed by the database session. However, it seems the time spend in the kcbgtcr() function is not consistent. Okay, the majority is 2 microseconds, but outside the 1 and 2 microseconds buckets, there are a lot of executions that totally fall outside of these, up to 262144 microseconds (262 milliseconds)! What could cause these huge changes in logical IO time? Warning! This script will run for a long time before it is compiled as kernel module!! Systemtap works by dynamically creating a kernel module from the system tap script, and insert it into the kernel. Because I injected a huge chunk of code to run in the kernel a lot of things are potentially influenced. I found the Oracle database to drop core’s for example. How to read: “>” means entering a function, “<" means return from a function. I selected a piece of the systemtap output/tracing where the counting procedure is visible. The first row is "< kdst_fetch" in other words: returning from kernel data scan table fetch. So this function has performed a fetch. Not surprisingly, the next function is qeaeCn1SerialRowsets, which I think is the count function. After the count, the kdst_fetch function is entered again, then kdst_fetch0. The next functions are kcbipnns, kcbrls and kcbrls_direct. Probably these functions are related to pinning and releasing blocks. See Alexander Anokhin’s post on that. A few functions further we encounter kcbgrcr(). Interestingly, it is followed by the kcbldrget() function, which is kernel cache buffers direct path loader get. In other words, Oracle has chosen to do a direct path read, because this is the function that starts off the direct path read code. The next function, kcblget() requests a block. This means that blocks read in this code path are from PGA memory, not SGA (buffer cache) memory. The next functions, kcbzvb, kcbhvbo and kcbhxoro are the block XOR checking functionality. The function actually performing this (sxorchk) is not visible because I did not probe for it. The next functions are not clear to me at this point (kcbztek_trace_blk, kcbl_objdchk_with_cache_reread, kcbtgobj, kd4obj). Then the kcbldrget returns, and the kcbgtcr function too. Here we can see that probing a huge number of functions does influence the performance of a process. While previously we saw kcbgtcr() took 2us, probably because of all the probes the time the kcbgtcr function took 62us. The next piece of execution is done by the ktrgcm function. This is handling undo and buffer cleanout. After that function, we cross kdr9ir2blk (function unknown), after which kdst_fetch0 and kdst_fetch return, and the count is done using qeaeCn1SerialRowsets. Okay, so far so good, but the question was: why are there logical IOs/kcbgtcr() executions that take excessively more time? If you go through the calls, you will see that the start is exactly the same, until line 17. After kcbgtcr>kcbldrgt (consistent read request function choosing direct path reads), the kcblgt function does not return immediately, but rather starts off a lot of extra code path. This code path fetches new blocks. The most striking thing here is that kcbgtcr requests the blocks, and physical IO is done on behalf of the consistent read request, in other words: on behalf of the logical IO. This is obvious if you think about it, if you want to read blocks you have to look if they are available or not, and if they are not available, you have to fetch them.